EclipseCon is the premier technical and user conference focusing on the power of the Eclipse platform. The BIRT project will be presenting a detailed half day tutorial on the extension and integration of BIRT. The presentation has been accepted and is on the EclipseCon schedule. As we begin the process of building the curriculum, we would be interested in any specific feedback on areas of interest that could be added to this presentation. In addition to the advanced tutorial presentation, we are trying to get two additional one hour presentations about BIRT added to the EclipseCon schedule. Your votes and feedback can help us to spread the word about BIRT. MySQL has posted a good article on using BIRT to report on a Bugzilla MySQL database. The article covers some of the BIRT reporting capabilties, such as connecting to Bugzilla, nested grouping of bugs by product and component, and totaling. Most often reporting tools pull data into the design tool or engine and then format, group and aggregate the data. The report developer fires up the design tool, creates the data sources and retrieves the result sets. The developer then proceeds to do the work of reporting. After completing the design, the report is usually deployed to some type of server. This model is usually sufficient for most applications. In embedded applications this model does not always perform to expectations. for instance, assume that I have built an RCP application that handles benefits. The user of this application works through several data collection screens. At the completion of this task the user needs to print a summary of all the picks that have been made. 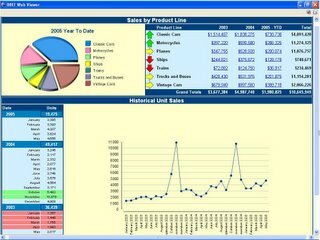 As the choices were selected they are persisted to a database, so the natural inclination is to start up the report designer and report the choices from the database. This is not optimal for many reasons. If we already have all the choices the user made within a Java Object, I why would rather use it as the reports data source. Doing this would save at least one more trip back to the database. Some tools do this by allowing an Object type to be passed in as a parameter. In BIRT, this can be done in several different ways. One of the more interesting and powerful ways is to use the addScriptableJavaObject method of the RunAndRenderTask class. This method allows the BIRT scripting engine to access the Java Object and use it as if it were native to the engine. This gives the application designer a lot of capabilities, such as passing in usernames, beans, and HTTPSession objects. The method takes two parameters. The first is the name the script engine will reference the object by. The second is the actual Object instance. In the case of our example, I add the BenefitObjectInstance as below. To use this object within the designer, I will reference the BenefitObject in script. I add a Data control and then place a reference to my Object in the Expression builder. In BIRT 2.0 an additional feature is being added that allows the application to pass in a full context object to the data layer. This will not only allow reporting off of existing Objects, but will allow things like credentials, parameters and connection handles to be passed in from the application. With BIRT’s M2 release, this feature is available now. I will write up a short example of how to use it in a later post. Scapa builds application performance testing, diagnosis and monitoring software. They currently use BIRT. Neil Sanderson Scapa’s Development Manager provided the following explanation. Scapa uses the BIRT reporting framework as a means of presenting its aggregated statistical data in a final, management-reporting-level format (HTML or PDF). 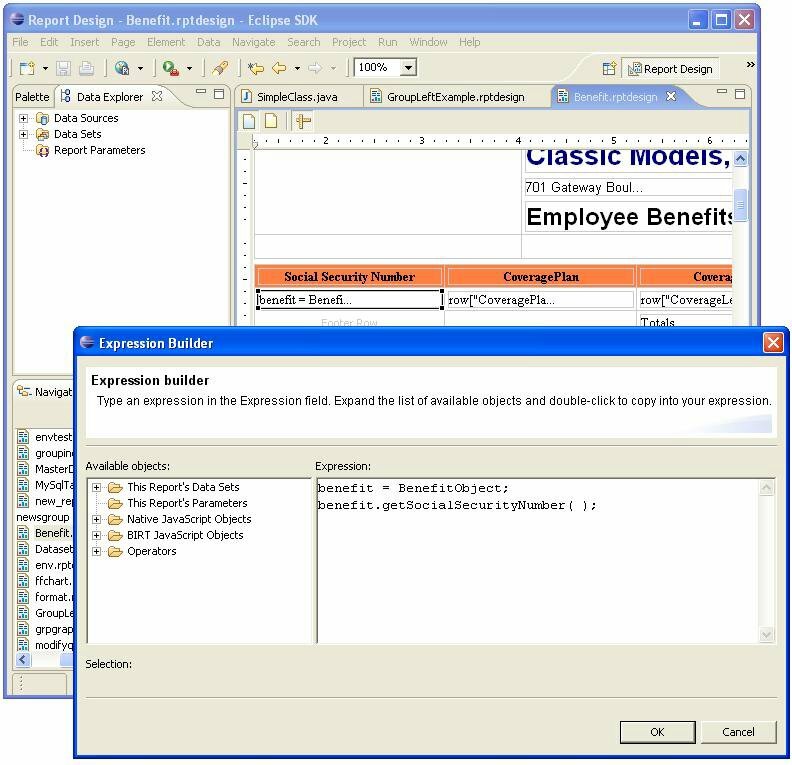 Scapa's existing test-execution and monitoring tool controls the content of any report as well as many presentation options (graph-colors, vertical-scales and ranges) and then uses BIRT's own APIs to construct a BIRT-compliant, tabular data structure from which the final report document (containing tabular and/or graphical content) can be automatically generated. You can use the BIRT APIs to embed the report engine in to your application, allowing parameter collection, report generation and distribution. Here is a screenshot from the completed report.